Kids don’t have limitless energy, they drain it from their parents. One of the elusive achievements in home ownership has always been completing a repair or improvement project in one trip the to the hardware store. In twenty or so years of owning a home and somewhere over 40 projects undertaken, I have never managed to complete a project in exactly one trip to the store. Either I have to go back and get something additional, or I have to go back afterwards to return something I didn’t need. This weekend I completed the very minor fix of replacing the toilet seat in the master bathroom. Probably about the simplest repair possible, but I’m counting it. I got a seat that matched in color, and that my wife was happy with when I got home. Neither of those are easy tasks. Last night I got out my copy of Shadowrun: Crossfire to try a solo play. I had originally planned to try the Extraction job that’s included with the game since I’d seen it was geared for 1-4 players, but it is marked as advanced difficulty recommended for runners with 5 or more points in upgrades (more on that in a future post). So instead, I set up for the Crossfire job and planned to play with two runners. My first play through started well enough but I ended up losing the just before the halfway point. I retried after swapping in a Troll for the Elf I was using for the second runner and going from a character with 4 hitpoints available to one with 9 made a massive difference, even if the Troll had a limited initial hand of cards. I enjoyed the game, although not as much as I did the one I played at GenCon for the release event. Partly just because it is more fun with more player cooperation, and partly because we had a fifth person managing the game and teaching us the rules. I know I made a few mistakes last night and that always drives me nuts, even though it’s pretty much a part of the board gaming experience. I’m planning a full impressions post sometime soon. I just really need to get a few more games in and get a better handle on the rules. In the meantime though, here’s a picture of the setup from the first game last night with a brief description. On the left side are the two runners I was using, a Human and an Elf. 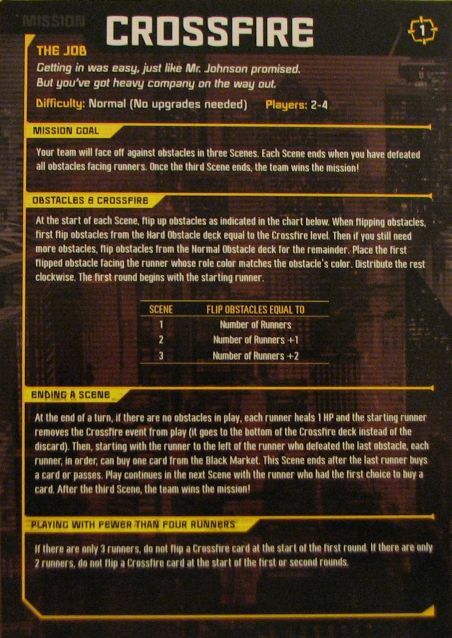 Each runner has two role cards, in a four person game each runner would have one role, and in a three person game one runner would have two roles. 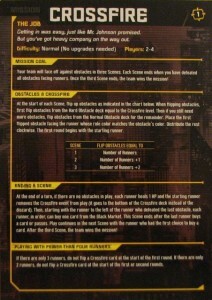 Next to the race and role cards are the runner’s draw deck and current hand. On the right side at the top are the six Black Market cards which can be purchased and added to a runner’s hand. As cards are bought, they are replaced from the Black Market deck. Below the Market are three more decks: Crossfire Events, Normal Obstacles (one bullet hole), Hard Obstacles (two bullet holes). Obstacles are dealt out to runners to defeat and Events are used to add additional hurdles to the game. I want the game! Looks like a lot of fun. Do you plan to get the expansion? I wish they would do a Shadowrun MMO ESO style. The SRO is not my cup of tea for an MMO. I backed the SRO Kickstarter and have played the Alpha a little bit. It is very similar to Shadowrun Returns as far as the actual gameplay, which I enjoyed but haven’t finished yet. I would definitely enjoy an ESO style game a bit more, but I’ll take whatever Shadowrun content I can get at this point.